It’s definitely safe to say that the second season of Kaiji is not as good as the first. Where the first had four distinct arcs that could keep up interest and hold up in the face of Kaiji‘s deliberate pace, the second season has two arcs over 26 episodes, both of which drag on too long (particularly the second arc). However, Kaiji‘s second season is still a good series, and there are some interesting strides made with Kaiji’s character. One of the dominant themes of Kaiji is that the titular hero has the potential for greatness within him, but for various reasons — some inherent within society itself, and others in Kaiji’s personality and work ethic — Kaiji cannot unleash his true potential unless his life is on the line. The second season pushes this idea further: When Kaiji sees Endou at the beginning of the second season, his eyes noticeably brighten and his mood skyrockets. He wants to erase his debts, but he also wants to throw himself headlong back into the world of gambling. He’s addicted to the high that living on the edge brings him. But that’s not what this post is about. What I really like about this season is that, for a brief moment, Kaiji takes a stand and becomes someone who can start something. He rallies a group of losers, nobodies and failures in this forced-labor camp and helps them regain a bit of their humanity by standing up for themselves against the dudes at the top who are taking advantage of them and acting like big shots in their own filthy, miserable world. In that time, Kaiji comes alive: He’s thinking of plans, he’s raising morale, he’s giving these people someone in whom they can place their hope. It’s not secret whatsoever that Kaiji as a whole is dead set against greed and hedonism in a capitalist society gone mad. By the time the second season begins, Kaiji has grown to actively undermining the games he plays to achieve victory. When he tries to play by the rules set by the oppressors, there’s no hope for victory; instead, he rewrites the rules to give his side the most advantage. In this way, Kaiji becomes like a revolutionary leader picking away bit-by-bit at those at the top in the hopes that eventually the empire will crumble. It’s a cool role for Kaiji, and my biggest disappointment with the second season is that it doesn’t build that up a bit more. This entry was posted on 12/17/2011 at 3:00 pm and is filed under 12 Moments, Kaiji with tags Kaiji. You can follow any responses to this entry through the RSS 2.0 feed. You can leave a response, or trackback from your own site. 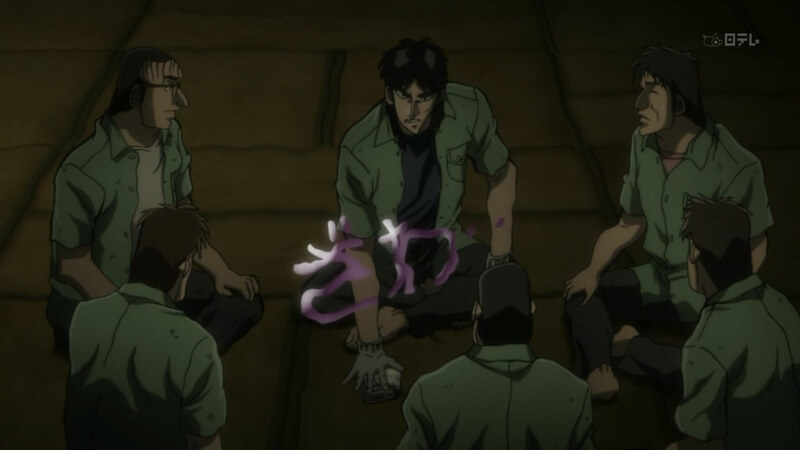 Kaiji had to take on a leadership role from the very first card game in that cruise ship in the first season. He constantly had to play not only for himself even then, and required the cooperation of others. The difference between the first and second season had to do with the quality of the people he leads. In the first season you had people fail him. Now you had some people who are redeemed by Kaiji’s leadership and their redemption fulfills him in turn. Yeah, you’re definitely right, there. I think the fact that the situation is so much more dire underground helps Kaiji find people who are willing to follow him to hell and back. The ship is bad, but the situation is set up so that guys will think to themselves, “Well, if I play my cards right, I can get off this place” and screw each other over to the amusement of the crazies watching them. The underground labor camp mostly exists to grind everyone there to dust. The worst that can happen on the ship “Espoir” is that you will be tossed into the underground labor camp. There is something brilliant about actually starting there — the worst has happened, and even worse things are bound to happen unless the revolution succeeds. I think the second season was just too long. It could have been every bit as brilliant, but it should have moved faster at times. By constantly dragging things out, the pachinko arc, in particular, lost it’s punch. To get back to the “revolution”, it is a pretty dark vision, because, as you suggest, Kaiji is not the ideal leader. He is about as flawed as any average human. I personally believe Kaiji is every-man, that is his failings are ours. Anyway, it becomes a cautionary tale about who our leaders might really be. Don’t scratch the surface, or be prepared to be disappointed. That’s definitely a legitimate way to look at it, and a view that is supported by the second season’s ending. Kaiji himself does not view himself as worthy enough to even be friends with these men once they’re out of the dumps. Responsibility outside of the lowest possible situation is something he can’t handle yet.